U.S. President Barack Obama and first lady Michelle Obama arrive in Dallas, Apr. 24, 2013. U.S. President Barack Obama will spend Thursday in Texas honoring his predecessor and the victims of last week's explosion of a fertilizer plant. 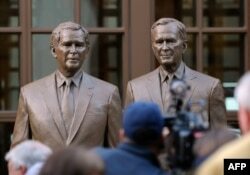 Statues of former Presidents George W. Bush (L) and his father George H.W. Bush are on display during a tour of the George W. Bush Presidential Center on the campus of Southern Methodist University in Dallas, Texas, Apr. 24, 2013. Obama and his wife Michelle will spend the morning in Dallas for the dedication of George W. Bush's new presidential library on the campus of Southern Methodist University. Obama will be joined Bush's father, former president George H.W. Bush, and two other former White House occupants, Democrats Jimmy Carter and Bill Clinton. Speaking before a Democratic Party fundraiser Wednesday, Obama said he was looking forward to attending the Bush library ceremony. Despite their political differences, the current president said his predecessor "loves his country and loves its people," not just "those who voted Republican. The Obamas will then travel to the city of Waco for an afternoon memorial service for the people killed when an explosion leveled much of the nearby small town of West on April 17.